Debenu PDF Aerialist takes Acrobat to the next level with its advanced tools for splitting, merging, stamping, bookmarks, hyperlinks and process automation. 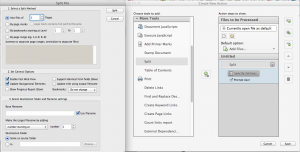 The content assembly functionality in Debenu PDF Aerialist and Debenu PDF Aerialist Lite allows you to split and merge batches of PDF files. Split 10 times faster when retaining bookmarks and links. Merge from control file for more advanced assembly. Save and reuse your jobs. Convert and Merge Convert and combine different files types, like DOC, XLS, EPS, PDF, etc. in one step. Note: Labels are used below to show the differences between Debenu PDF Aerialist Lite and Debenu PDF Aerialist. Aerialist only indicates the feature is only available in Debenu PDF Aerialist. Aerialist enhanced indicates that Debenu PDF Aerialist contains additional subfeatures to those within Debenu PDF Aerialist Lite. Split into n pages – into files containing n pages per file. Split by page marks (Aerialist only) – visually highlight sections of a PDF to split. Split by page ranges (Aerialist enhanced) – split pages, page ranges, odd/even pages. Split by bookmarks (Aerialist enhanced) – split based on bookmark hierarchy. Merge files (Aerialist enhanced) – merge large document collections together. Batch process – use the split command to process large PDF document collections. Split PDF files into a set of PDFs with each containing a specific number of pages. For example, choosing to split a 30 page PDF into five page PDFs will produce six PDFs. Use the page marks toolbar buttons to visually highlight sections of a PDF to split. Use them to name the files to be split and to add document info to them, including title, subject, author and keywords. Use the bookmark hierarchy and bookmark levels to determine how to split your PDF files. This can be particularly useful when bookmarks are based on the sections and structure of your PDFs. When splitting, Debenu PDF Aerialist uses the bookmark text to form the file names of the resulting PDFs. Debenu PDF Aerialist Lite lets you split your PDFs based on first level bookmarks. Debenu PDF Aerialist lets you split your PDFs based on any range of bookmark levels. For example, if your chapters and headings were all level 2 and 3 bookmarks, and you wanted to created a separate PDF file based on these sections, setting the levels as 2 to 3 would generate the correct splitting process. Split individual pages into new file(s). Split page ranges into new file(s). Combine pages and pages ranges. Separate page ranges into separate output files. Use overlapping page ranges to create multiple files. Split into odd and even pages. By combining page numbers with simple parameters (commas, dashes, semicolons, odd, and even), you can specify which pages should be merged together to form a new PDF, and which pages should be split separately to form another PDF. Splitting by odd and even pages, and reversing pages are Aerialist only features. ‘ page separator 1-20, 30-40 would create a single PDF containing page 1-20 and 30-40. – from/to 1-5 would extract pages 1 through 5 into a new PDF. 5-1 would extract pages 5 through 1 into a new PDF (reverse order). ; file separator 1-20; 21-40 would create two new PDFs – one containing pages 1-20, the other containing pages 21-40.
even even page 1-20 even would create a single PDF containing only the even pages within the range of 1-20.
odd odd page 1-20 odd would create a single PDF containing only the odd pages within the range of 1-20. A common problem when splitting PDF files is that most of the connections between the links and their end points are broken because they are no longer located in the same PDF file or because the pages have been rearranged. The advanced ‘update navigational elements’ feature updates all links in bookmarks, links and destinations, ensuring all links are correctly maintained. A destination (or named destination) is a link represented by text in the ‘destinations’ palette. The destination represents the end point or the target of the link using the destination. Users often use destinations because the end point location and page view are set and are not affected when a file’s pages are increased, decreased or reordered. Destinations are normally broken when the link and its destination (or end point) get split into separate files. A bookmark or link often links to a page number, rather than a destination, which makes it even easier for links and bookmarks to point to the wrong location when making changes to the pages in a PDF. Convert and combine different files types, like DOC, XLS, EPS, PDF, etc. in one step. By using the properties of the files you want to merge, it’s easy to order your files prior to adding them to the merge list — making it much easier to manage when trying to merge a large amount of PDFs. Once you’ve added your PDFs to the merge list, you can edit the order and page ranges you want to include in the merge. Debenu PDF Aerialist Lite – supports up to 100 files at a time. Debenu PDF Aerialist – supports an unlimited number of files per process. Use the ‘split’ command to process batches of PDF files. Adobe® Acrobat® comes with its own ‘batch processing’ tool that allows you to setup simple processes by combining a series of commands. Debenu PDF Aerialist Lite adds the split command, meaning you can combine these with Acrobat’s built in commands to process large batches of PDFs.